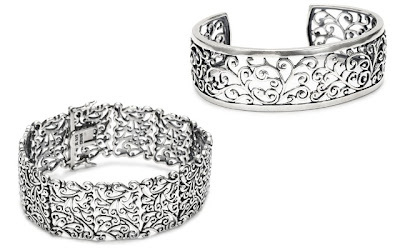 Daily Jewelry Deal: 81% Off Sterling Silver Filigree Bracelets w/Free Shipping! This Sterling Silver Oxidized Filigree Bracelet, 7.25" is currently selling for just $84.55 on Amazon.com! You will be saving 81% off the listed price of $434.99 with this jewelry deal. Also on sale is the this Sterling Silver Filigree Cuff Bracelet, which is currently selling for just $70.30 on Amazon.com! You will be saving 81% off the listed price of $369.99. What I like about these bracelets are the intricate filigree patterns, proving that you do not necessarily need glitz and glitter to make an impression.